Doesn't that just so often describe life. Even when diving, we follow a rigid schedule. We have to get a fill tag on as soon as we get aboard. As soon as the last diver is aboard, get the anchor up, do roll call and get the boat moving. The boat has to find the next spot. If conditions aren't good there, quick decisions must made or we're not going to get in 4 tanks. Diving is exciting and beautiful. It is refreshing and it forces us to forget the nutsyness of our lives, but does it really get us to slow down? Not always. It is very easy to miss out on the serenity of nature. Not today though. 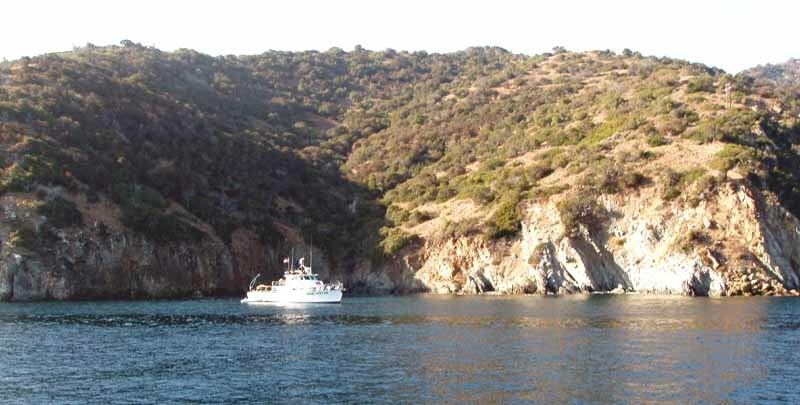 Today was about a leisurley, comfortable cruise exploring along the west end of Catalina Island on about as comfortable a boat as you could ask for. To me, the two best parts of diving is taking in the beauty of nature and the exploring. I always swim along wondering what I will find next. There is another opportunity than diving to do that while at the Islands. It is simply the boat ride. Cruising down the shore, exploring with no particular destination, taking in the sights, sounds and smells. 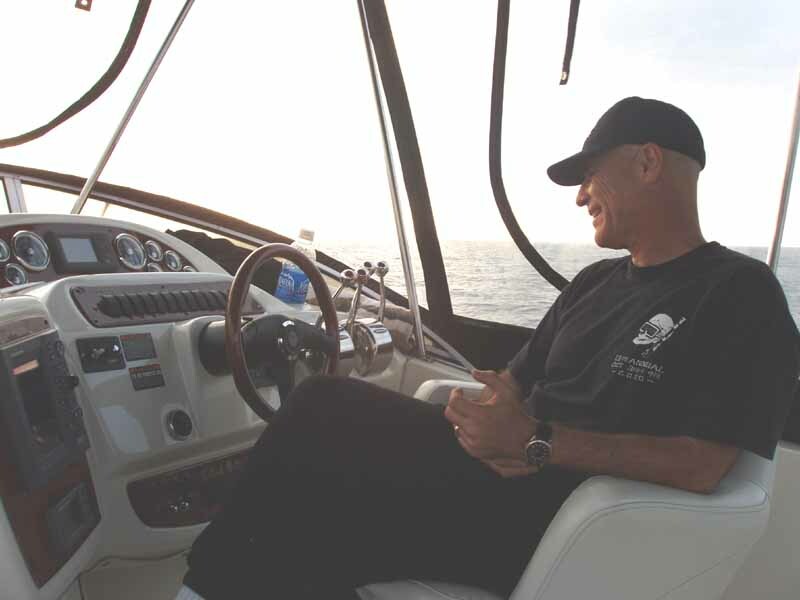 I've told you the story of the Raider, one of the finest dive boats there has ever been. Well after the time of the Raider, Skipper Mel got the Rapture and made it into another vessel to be remembered. I'd tell you her story, but I can't because it still isn't written. Oh, I can type away what words I want, but it's story will only be written in time by the adventures of those who ride aboard her seeking the experiences that the ocean offers to those strong and loyal enough to seek out her secrets and lessons. 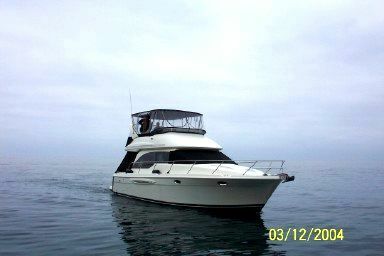 I can say this, she is big, fast and well equiped to take you in comfort anywhere you want to go in the fantastic diving offered by California. Today she took us in comfort to a place of refreshment and peace. 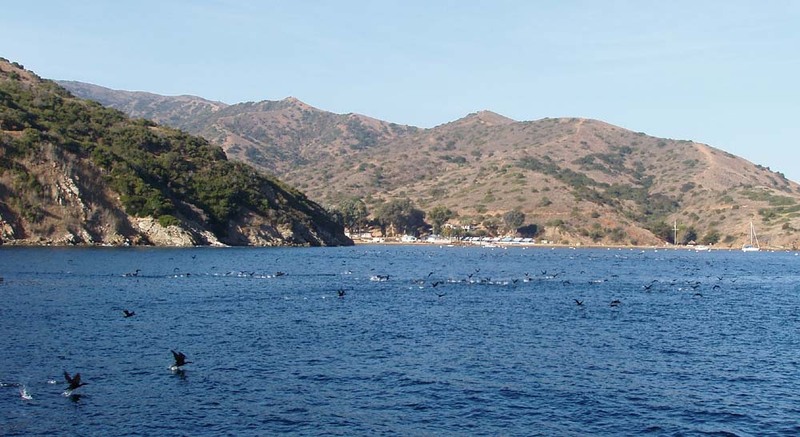 Today she took us cruising Catalina Island and we were in no hurry at all. Mel showing what he thinks of autopilots on boats. The intense diving of the night was past. Late the next morning we took it easy and had some strong coffee. Mel wanted to meter new places he thought there might be deep reefs. The water was flat. The morning was a beautiful, calm and misty. I was going at it with my camera. One of my amusements these days is trying to get panorama pictures. There is no better place for it. We pulled anchor and headed West. The Rapture is a fast boat, but today we were cruising slow. There was a spot to check and sure enough there seemed to be rocks near a quarter mile from shore, but how many and how large? We slowly metered back and forth over it using the plotter to judge its shape and where we were. Sure enough it was a small, but very divable reef extending from about 60 feet to 130 feet in sections about 20 feet wide. It rose high enough that it would certainly have some population of lobsters on it. It probably had been seen by no divers this entire year. It took a while to cover the area, but the dual frequency depth recorder gave us a a good idea where the reef was and what its high points look like. It's location was carefully recorded in the plotter. It was getting nicely sunny and we unzipped the plastic windows of the bridge to a nice breeze. Relaxing on the spacious, well padded seating, we had a great view of everything around us. 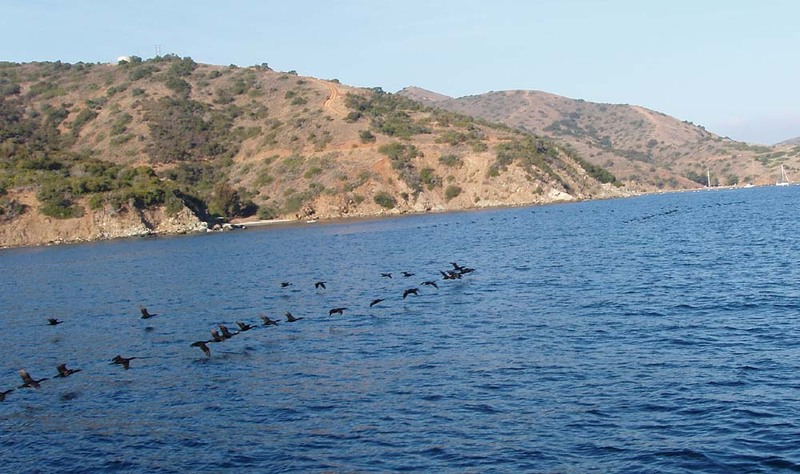 We were commenting on the many wedge formations of some large black seabirds that quickly passed us towards the West, travelling less than two feet over the waves. We passed the dive boat Sand Dollar anchored in a cove while its divers explored a near shore kelp bed. There was another area down the island near Emerald cove that Mel wanted to carefully check so we slowly continued to motor to the west. 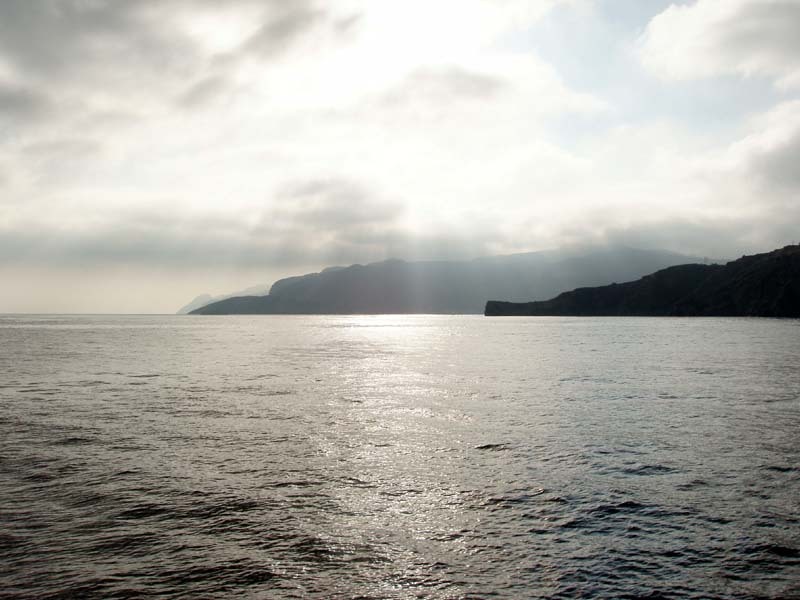 In the sunlight, the calm sea was a brilliant deep blue. As we went, more and more of the black birds passed us, mostly in flocks of 20 to 30. We couldn't guess where they were going, but as we neared Emerald Cove, we could see. There were probably a couple thousand of them on the water there. As we were approaching from still over a mile away, they all seemed to descide at the same time to go somewhere else. They left a white trail behind from the splashing of their takeoffs. Even from where we were we could hear the calls of the nearer ones. They went off in every direction while some straggler groups were still arriving. I can't say where, but we metered a very large area that showed good reef structure. The radar showed that nicely it was more than the distance from shore needed to stay out of the reserve. This was a prime hunting area as large as it was. A diver would have trouble swimming its length from 130 feet to 70 feet in a single tank. Another place to come back to and explore. 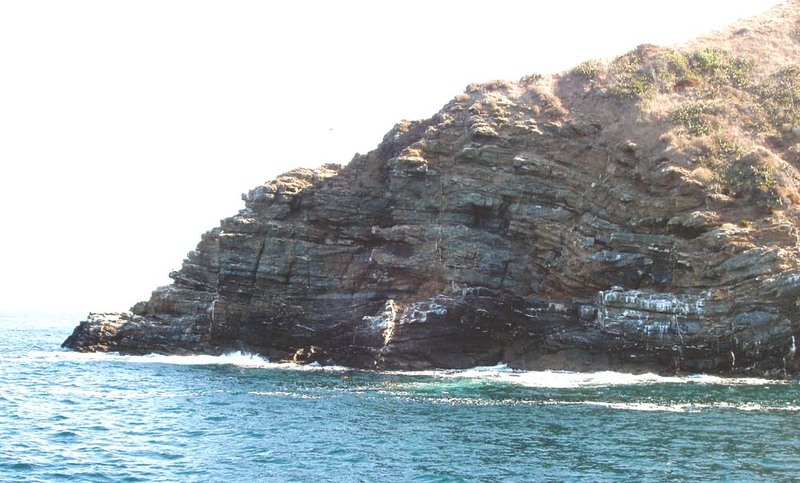 After that we slowly continued down the shore along vertical cliffs that showed the rock layers that make the island. There was all kinds of twisting to the layers showing the forces of earthquakes that had forced these offshore mountains above the sea. Some places the land was turned completely on its side. Other places, landslides had sent the rocks back under the water. Twisted layers of the land. It was still before the rains, so the brush along the shore was thin and dry with occasional green patches of chapparel. In each cove was a deep narrow canyon going up with trees growing where there would be a short lived creek in the rainy season. All along under the cliffs was clear green water with kelp beds floating near shore in calm protected coves. Some places the kelp extended away from the cliffs showing that fallen rocks extended out to make a reef area for the kelp holdfasts to grow on. At one point, we saw what looked like a big fish or perhaps a turtle. Close up we could see that it was a deer that had gotten too close to the cliffs. It was getting on in the day, but we wanted to look in the light at the spot we had been the night before. 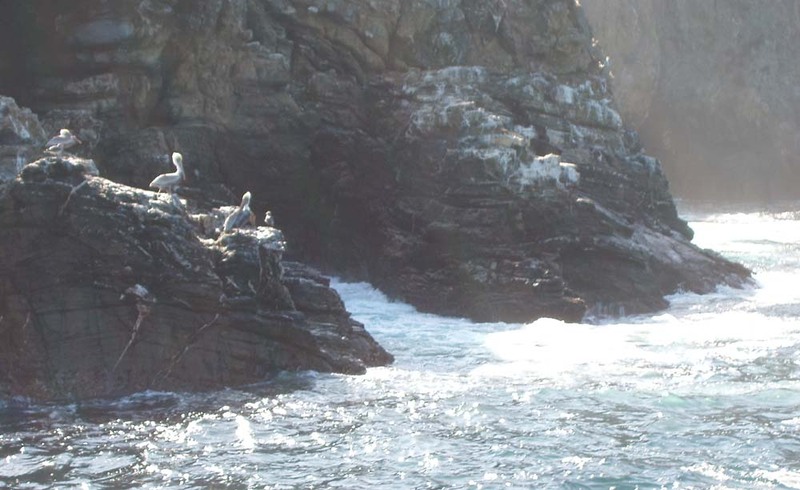 The cliffs ended and we came around the wave washed point where pelicans soared on the wind above the cliffs or rested on the mist covered rocks. It's different when you can see the cove it in the light. It was a nice looking area with quite an extensive kelp bed surrounded by plunging cliffs. Waves were hitting all along a rugged rock shore. About a mile down were some steep offshore rocks rising up, but this was almost the West end of the island and was completely exposed to the big north and west swells. We still had no idea where the other diver we saw the night before had come from. We could see for quite a ways and there didn't seem to be any place where we could have missed seeing their boat. At the point, pelicans glided on the wind drafts rising over the point or resting on the rocks above the waves. It was rougher than it had been at night. Spray and mist rose into the air along the shore of the cove. Even with more waves, you still don't notice it much in this boat. It was still pleasantly cool, but the sun shone down and glared back from the water. It was time to change state. We had cruised about as far as we could go this way. It was time to change course and speed. As we left the cove we could see Ship Rock through the haze in the far distance. It was time to zip up the windows against the wind and let the Rapture take us to another world across the channel.